Finished Medallion is 23.2" in diameter. Take a look at this gorgeous Inlay stencil for furniture! You don't have to be a world traveler, millionaire, or furniture collector to enjoy the exotic look of inlaid furniture. Now, with our Indian Inlay Center Medallion stencil, surrounding yourself with stunning furniture is just one fun DIY project away! Free Stencil Border included for finishing the edges of your table. 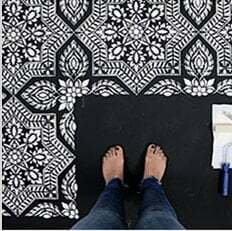 These beautiful furniture stencils help you to transform that garage sale find into a treasure that works in almost any decor. Fits 24"+ diameter tables, also can be used as a ceiling/floor medallion, or to stencil a small rug.